A Birthday Greeting / Albert W. Ketèlbey. (Vienna State Opera Orchestra conducted by Armando Aliberti). Composed in honour of the birthday of H.R.H. the Princess Elizabeth of York, to whom, by special permission, it is most respectfully dedicated, April 21st 1932. 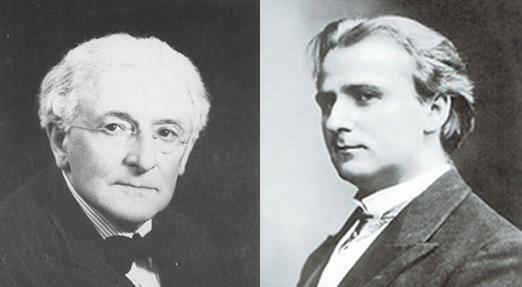 Albert William Ketèlbey (1875 – 1959), English composer, conductor & pianist born in Birmingham. He became famous for composing popular light music, much of which was used as accompaniments to silent films, and as mood music at tea dances. He used the pseudonyms A. William Aston, André de Basque, Dennis Charlton, Raoul Clifford, Geoffrey Kaye and Anton Vodorinski for some of his works (some reference books mistakenly give Vodorinski as his true name and Ketèlbey as the pseudonym). His name is frequently misspelt Ketelby. 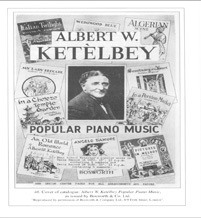 This website is a reference point for all admirers of Albert Ketèlbey's music. It is being developed by Peter and jane Deverill. (Jane is Albert's great -niece). We would be interested to hear from anybody with related material that might be of interest to others. If you would like to be kept informed of future developments on this site then please contact us at enquiries@albertketelbey.org.uk and ask to be added to the mailing list.